Baking sponge cake is rather challenging. It’s either the cake rises too much or it turns up to be horribly hard. I've never succeeded in baking sponge cake from my old oven previously and had given up trying to bake sponge cake. This is my 1st attempt in baking sponge cake successfully. Look! It really tastes good. It's so puffy and soft. It's light too. I was kind of shock at first to see the cake shrank a little bit when it’s cooled down. Later I found out that it is because no stabilizing agent is used. So there’s nothing to worry. It is a good recipe to use it as a basis for many kinds of layered cake. Invert the cake and let the bottom be the top for spreading cream and decorating. A cup of coffee to go with piece of sponge cake, it’s not a great accomplished afternoon tea but it’s has a simple charm that makes it a pleasure. 1. Whisk egg yolk with sugar. 2. Add in corn oil and milk, stir to continue. 1. Add cream of tartar into egg white, beat ill foamy. 2. Gradually add in sugar, beat till stiff peaks at speed. 1. Take 1/3 portion of egg white mixture and use hand whisk to mix with the egg yolk mixture till light. 2. Fold in the balance of egg white mixture into egg yolk mixture, combine well. 3. Pour batter into the pan. Line the baking tin with baking paper. 4. Bake at pre-heated oven at 180 Deg C. Then put the pan into the oven and bake at 180 Deg C for 27mins. 5. 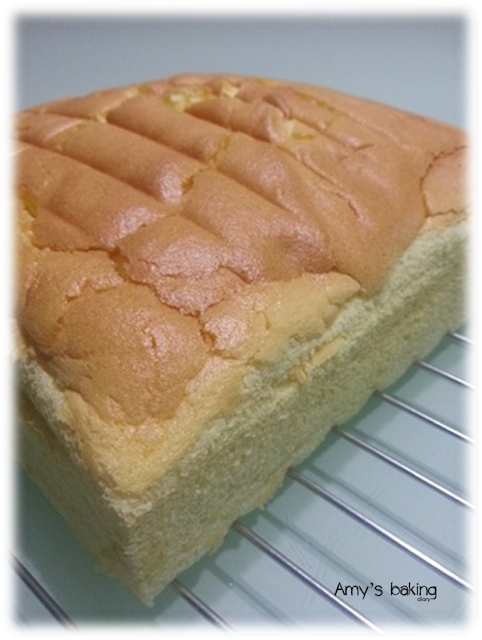 When it’s baked, remove the sponge cake from oven and cooled the cake upside down on a wire rack before unmolding. 1. Whipping of egg whites has to be extremely careful. The mixer attachment and bowl have to be washed clean. Whipping of the egg whites will be affected negatively if there’s slightest of remains stick on the utensils. 2. Eggs at room temperature whip better than eggs straight out from the fridge. 3. If you want the cake to rise well, add the whipped egg whites immediately onto the batter and do not keep the batter too long after the whipped egg whites has been folded in. 4. Always fold the lighter ingredient and there’s egg white into the heavier ingredient, which is the batter.